The redevelopment, known as The Hub @ New Brunswick, is years in the making as a project by the nonprofit New Brunswick Development Corp., or Devco. But the project on Monday became an official priority for the two-month-old Murphy administration, which could now play a significant role in bringing tenants to the property. For instance, Murphy said the state Economic Development Authority will immediately begin a planning and implementation study for the site, which includes a shovel-ready, four-acre parcel that is approved for more than 2 million square feet of commercial, research and retail space. The influential agency will also have a role in identifying potential partners for the project. The Hub will rise at the longtime site of the Ferren Mall and parking deck, an aging concrete structure next to the New Brunswick train station. 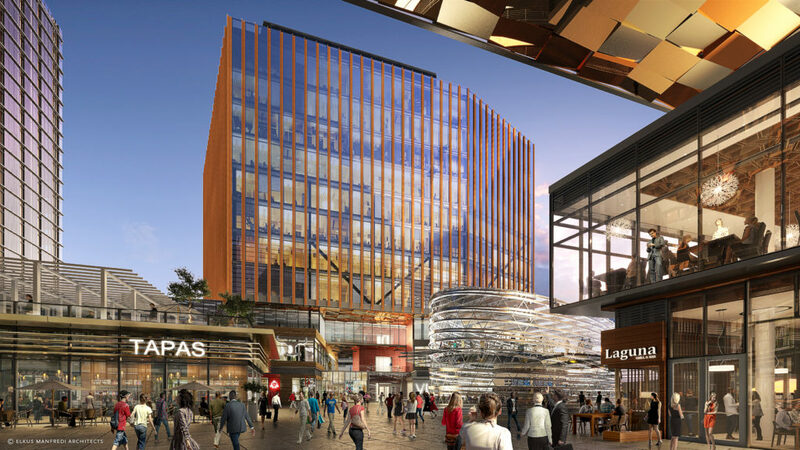 Devco has since demolished the massive structure to clear the way for the project, which it has positioned as a vibrant, urban destination for companies seeking access to Rutgers University and health care institutions. 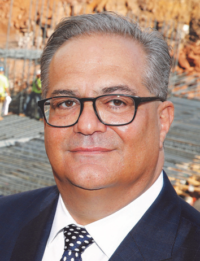 On Monday, Devco President Christopher Paladino said Murphy, “in one fell swoop, supercharged our effort” to build such a hub. Not only did the governor convene “30 to 40 of some of the most critical players” in academic research, private-sector research, government and the labor, Paladino said, but he stated that the project was a priority. “What we’ve always talked about — building an ecosystem that will foster innovation — is exactly the type of development that the governor wants to see happen,” he said. Paladino added that companies that are founded in such environments have the tendency to stay and grow there. 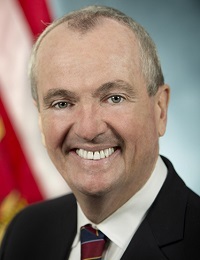 For Murphy, the project dovetails with a campaign promise to spur the growth of startups and innovation-minded businesses. He cited a familiar statistic from his platform, noting that New York has 179 incubators while New Jersey has only 15. The governor made the announcement surrounded by the likes of Rutgers President Robert Barchi and Barry Ostrowsky, CEO and president of RWJ Barnabas Health. They were among a stakeholder group assembled by Murphy that also includes public officials such as New Brunswick Mayor Jim Cahill, labor leaders and executives from Johnson & Johnson, which is based in the city. 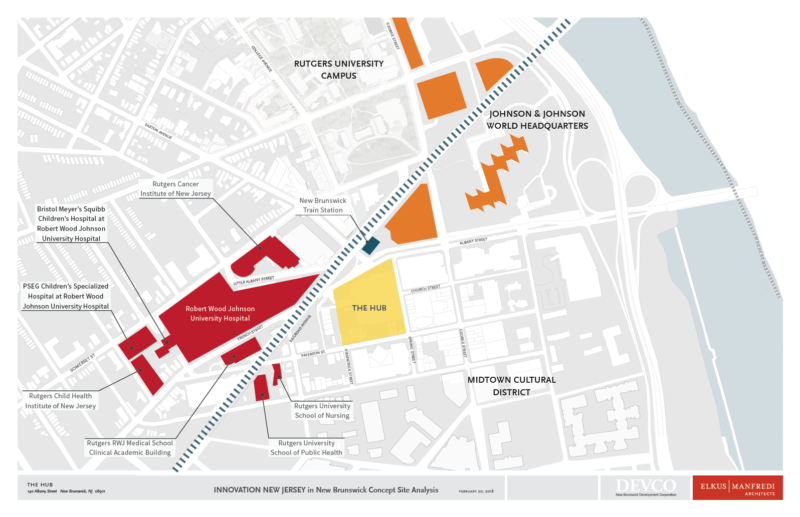 By all accounts, the various anchors and institutions have much to gain from what Murphy and Devco envision for the project. Ostrowsky noted that Robert Wood Johnson University Hospital, one of the city’s main anchors, is operating with a mandate that now includes being a source of economic development for the region and providing services for the community. The hospital can achieve that in part by expanding its footprint in health care research, he said, which will result from partnering with Rutgers and other institutions. Barchi added that Rutgers “recognized that research and innovation was core to what we did” as it crafted a strategic plan around 2013. That meant finding a way to create a technology hub in the city, a plan that he said had stalled but has now been jumpstarted by Murphy’s support for The Hub. The governor on Monday said there will be more specifics forthcoming as to how the state will support the development and how The Hub would be financed. That effort will evolve in the coming years, he said. “This is not a ribbon-cutting ceremony,” Murphy said. “This is the first step in a long journey that will take a long time, but it is a journey that will be worth it. The Hub is approved for up to 4 million square feet of commercial development at full build-out. Devco, which is marketing The Hub with JLL, has had discussions with prospective tenants over the past two years as it prepared the site of the project’s first phase.